As the development director of a non-profit, Paige Lamonica has met her fair share of people. But Will is something else entirely. The hot detective is a little too confident, and far too easy on the eye. She loves that he goes toe-to-toe with her at every turn. When Will asks her to attend his sister’s wedding with him, she thinks he just wants to throw off his scent some relatives with a penchant for matchmaking. 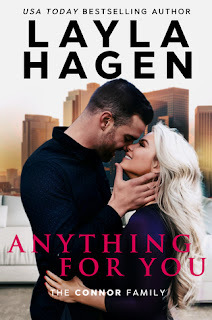 Meant for you is the third book in the Connor Family series by Layla Hagen. From the start Will and Paige were intoxicating. They had an immediate chemistry, and Will's presence took over the pages. I love the bantering between them as well. They're cute and funny. Plus, there's drama thrown in to add tot he interest. You get to see couples from the previous books in the series, and let's not forget the Bennett's! I thoroughly enjoyed this story from beginning to end. The ARC of Meant for You by Layla Hagen was kindly provided to me by InkSlinger PR for review. The opinions are my own.